As DC Universe Online Merges Into "Megaservers," Which Hero Will Keep His Name?! 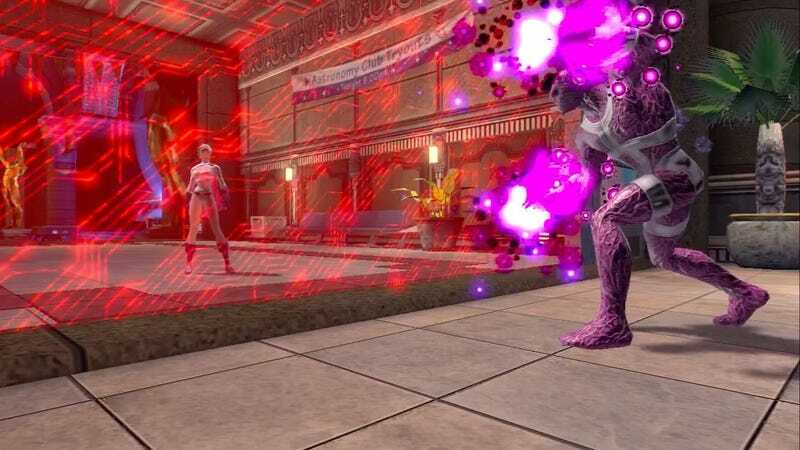 Four "Megaservers" unifying DC Universe Online by platform and region will deploy on Monday, offering larger populations for raids, alerts and other missions, as well as swapping between PvP and PvE on demand. Now, many of you are already wondering "Whoa, what about my hero's name?" Or villain's. See, if that cool moniker you thought up was taken on one server, maybe it was clear on another. But now all servers are getting merged down into four groups. So if two North American PS3 players separately chose "Ulterior Motive Man," on the old Killing Joke and Justice servers, who gets to keep it on the new, single PS3 megaserver for that region? At a fan appreciation event at Comic-Con 2011, the DCUO staff laid out the rules. Basically, if there's a "collision" in name choice, whoever has an active subscription at the time of migration will get to keep the name. If two players have active subscriptions and the same name, then whoever has the most hours logged in the game gets to keep it. If you lose out, you will get a free Name Change token and instructions on how to change your character's name if you don't wish to keep the handle assigned by the system. All I can say is, look for alternate spellings, ways to abbreviate or shorten the name, or delete spaces. All Captains can become Capts, Doctors are Drs and vice versa. Or you may use the opportunity to completely rename yourself, and then go re-spec your powers and essentially create a new character at whatever level you've achieved. Hopefully, that's the only icky detail of switching from individual servers to one giant server for each system and region. In the new layout, DCUO members will be able to swap between PvE and PvP "phases" by visiting the Watchtower (if they are heroes) or the Hall of Doom (for villains). A "Phase With" command will be available in DCUO's Social quick menu, allowing you to participate in the same PvE/PvP phase as a friend.